With today’s reveal of Destiny: Rise of Iron Bungie has revealed that the expansion will only be coming to the Playstation 4 and Xbox One, this meant that this would not be coming to the Playstation 3 or Xbox 360 which ultimately splits the fan base. So what was the reason behind this decision? Bungie has put up a post on their official website that details what this means for last generation players. Should you be unwilling to upgrade to a Playstation 4 or Xbox One version of the game you can at least still play Destiny as we see it now, but no new content is planned to arrive on these older versions of the game. Characters will progress separately on previous-generation hardware as opposed to being shared between generations. Those who do upgrade following this split will be able to port their Guardians to the new generation, you are just going to need to stay within the same console brand, Playstation 3 to 4, Xbox 360 to One. 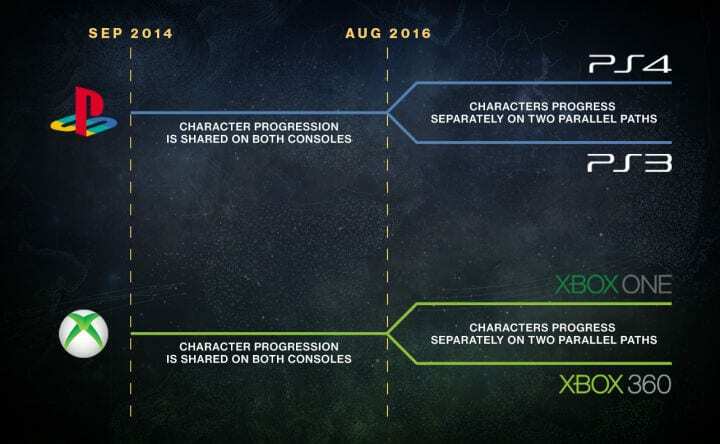 Bungie promises that more information will be shared about how this console split will affect players in the future, this just shows that the Playstation 3 and Xbox 360 are simply more or less dead, and the games are demonstrating this.